From Genghis Khan to the arid wastes of the Gobi desert, from being the Soviet Union’s most Stalinist satellite to the first Asian communist country to embrace democracy, Mongolia has always been an area of mystery and dread to westerners. Studied in school as part of the core world history curriculum, the Mongol Empire once stretched across Asia from the Pacific Ocean to Kiev and Baghdad. In modern times, interest in Mongolia has been suddenly sparked by the opening up of the country after 70 years of isolation in the Communist bloc. Encyclopedia of Mongolia and the Mongol Empire is the first comprehensive A-to-Z encyclopedia of Mongolia and the Mongols. It provides accurate and readable entries on all aspects of this people’s turbulent history and rich culture, from prehistory to modern times. While particular emphasis is placed on the Mongol Empire, entries cover the country’s entire history and range from geography to culture and religion to personalities, battles, daily life, and folklore. Major entries are accompanied by a further reading list to guide readers to selected resources for more in-depth research. This volume is a great first stop for research on Mongolia as well as a valuable reference for those wishing to expand their knowledge of a region that is, to most westerners, exotic and relatively unknown. "This is undoubtedly a welcome addition in response to the increasing interest and the growing literature on Mongolian studies...recommended." "Author Atwood, a professor of Mongolian history at Indiana University, clearly knows his material." 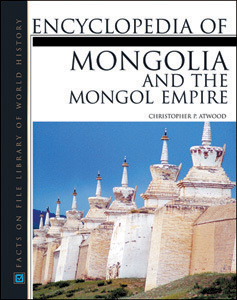 "...the information it offers on Mongolia's history and culture is impressive in scope and both authoritative and scholarly...Recommended for all university libraries." "The first English-language encyclopedia devoted specifically to the Mongols...[a] handsome volume...Engagingly written, superbly authoritative, and long overdue, this reference will suit anyone interested in medieval inner Asia or modern Mongolia...Highly recommended..."
"Professor Chris Atwood, well known among the tightly knit circle of Mongolists, has accomplished a monumental feat—the publication of the definitive encyclopedia on everything Mongolia...valuable, well-written, and thoroughly researched..."